Windows users often face the problem of not remembering their login and admin password; this causes inconvenience for them when trying to access their IDs. PassFolk has come up with a solution to this problem. PassFolk SaverWin is a Free Password Recovery Tool offered by PassFolk which is a free-of-cost tool that helps you to recover forgotten Windows password without re-installing their OS (Operating System). 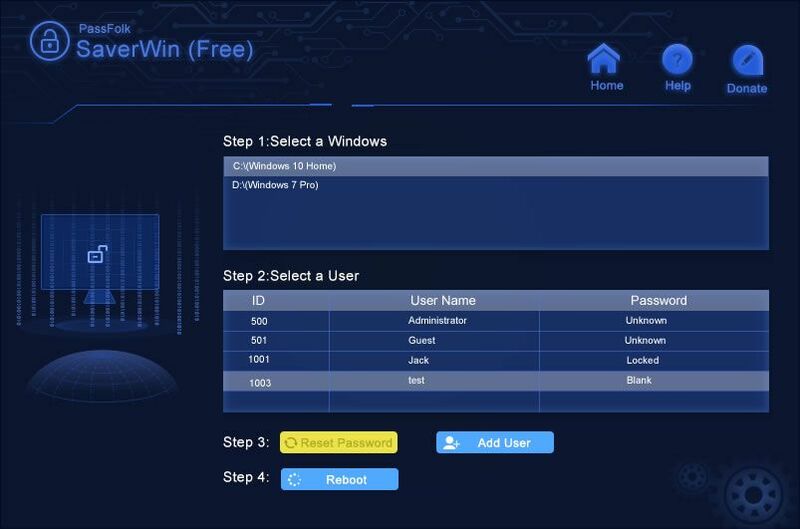 This Free Password Recovery Tool works on all the Windows offered by Microsoft whether it is Windows 7, Windows 8, or Windows 10. Reset All Passwords: You can remove the entire password, whether it is of the admin or of the user from Windows 10/8/8.1/7/XP/Vista. Windows server and Microsoft account password can also be removed. This Free Password Recovery Tool provides a great interface to the users. Supports UEFI-Based and Legacy BIOS: Many of the tools are incompatible with UEFI-based computers. But SaverWin software is wholly compatible with both Legacy and UEFI-based computers. It automatically recognizes the BIOS (Basic Input/Output System). It has One-Key to Start procedure; no special technical skills are required for its operation. Add New Users: Through this tool, you can add unlimited users and passwords to your Windows system. Attractive Graphic Interface: The tool offers an amazing graphic interface to the users. Reset Server Password: All Windows Server Versions are supported by this Free Password Recovery Tool. It versions supported by SaverWin includes Windows Server 2016, 2012, 2008 R2, 2003 and many more. Supports 300+ Computer Models and Tablets: SaverWin-PassFolk’s Free Password Recovery Tool is compatible with almost all models of desktop and laptops, for example, Dell, HP, Acer, Toshiba, Lenovo, and Asus etc. Recover Lost Windows Login Password: Recovering Windows password is not an easy job but SaverWin makes it easy. It not only saves the system from re-installing the OS (Operating System) but it also prevents the loss of data from the computer. It completely removes the lock screen to ease the work. Download the SaverWin Tool by PassFolk: To reset the Windows password, you should download SaverWins and install it on their device. You can download the tool from the official PassFolk website by clicking the “Download” link or you can even click this direct link to save some time. 2. Burn CD/DVD or USB Flash Drive:To create a Windows password reset disk, you should first burn the device. SaverWin provides a default ISO file for quick recovery. 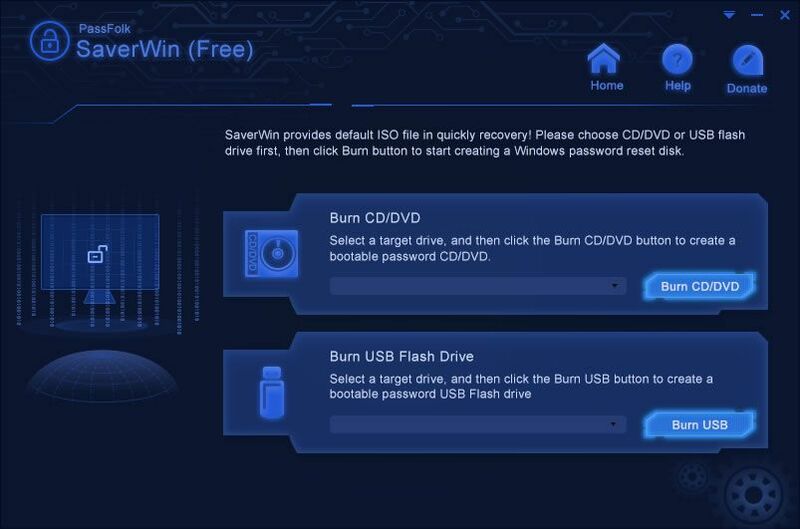 Burn CD/DVD: For this select a target drive and then click on the “Burn CD/DVD” button in order to create a bootable password CD/DVD. 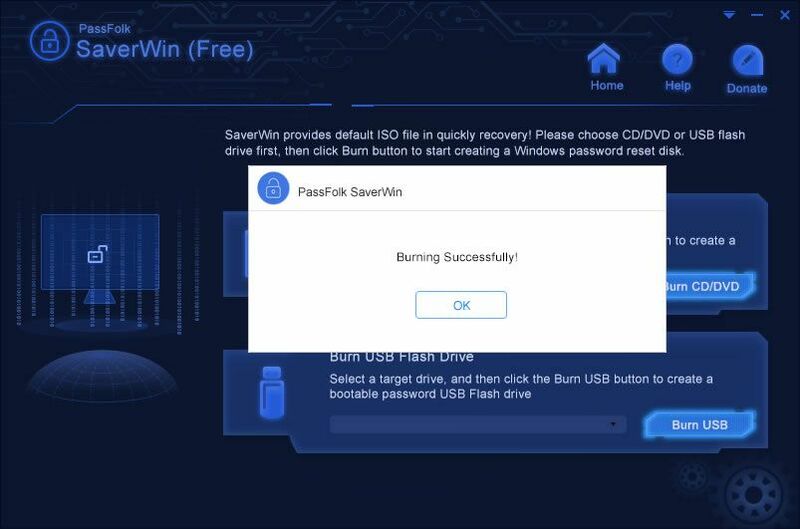 Burn USB Flash Drive: Select a target drive and then click on the “Burn USB” button to create a bootable password USB Flash drive. Once the burning procedure is completed, you will receive a pop up window with message “Burning Successfully!” After that you can move on to the next step i.e. RESET. Reset the Windows Password: The last step is to reset the password. STEP 1:- One the software is installed on your device, open the software, the system will ask you to choose your Windows Version. SaverWins supports most of the versions offered by the Microsoft. STEP 2:- After choosing the Windows Version, select the user whose password has to be recovered. STEP 3:- Once the selection of Windows Version and of the user is done, click on the “Reset Password” button. If you want to add any new user you can click on the “Add User” button which is on right of the “Reset Password” button. STEP 4:- Click n the “Reboot” button available just below the “Reset Password” button. Create a Password Reset Disk: You can create a password reset disk in two ways i.e. USB and CD/DVD. It makes it easy for you to crack the password no matter how complicated the construction is. SaverWin is a Free Password Recovery tool that helps you in recovering your Windows password. This tool from PassFolk is of great use. It is easy to use and is compatible with almost all the devices. The best part about this software is that it is free-of-cost. The user interface provided by the software is also appreciable. SaverWin from PassFolk is must try the software for the user who has problems related to their login password.